Reversible skid shoes: The HA Series comes with 1 ¾” thick solid steel skid shoes that easily bolt on. Simply rotate the skid shoes to extend their life. 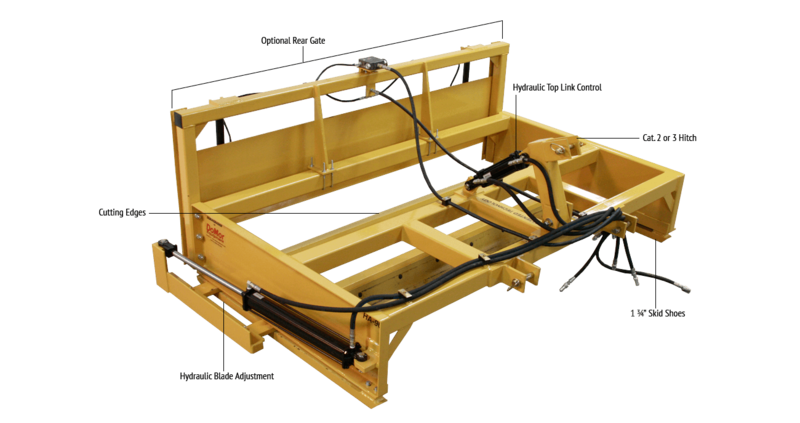 Quick hitch compatible: Comes with two pre-drilled holes for the top link pin, giving you the versatility of hitching to any category 2 or 3 tractor with a quick hitch. HA-72 1,290 lbs. 50 HP. 89 in. 40 in. 60 in. 6ft. HA-84 1,470 lbs. 60 HP. 101 in. 40 in. 60 in. 7ft. HA-96 1,660 lbs. 70 HP. 113 in. 40 in. 60 in. 8ft. HA-108 1,925 lbs. 85 HP. 125 in. 40 in. 72 in. 9ft. HA-120 2,340 lbs. 100 HP. 137 in. 40 in. 72 in. 10ft. HA-144 2,560 lbs. 120 HP. 161 in. 40 in. 72 in. 12ft.